In case you missed yesterday's post on group etiquette in the backcountry, here's the link to the story, Learning to share in the backcountry. Today I continue with the topic of sharing, playing nicely, and being a fabulous person to share space in the mountains with. You don't think it happens? It hasn't happened to us recently so maybe people are smartening up but in the past it happened to us about 50% of the time when we've stayed at an Alpine Club of Canada Hut. Scenario one - we were at the Elk Lakes Cabin when two families showed up as it was getting dark. We had the whole hut booked and they knew this but in their own words, decided to come anyway and camp outside. By "camp outside", they meant that they would be cooking dinner in the hut, hanging out with us until bed, and coming back in for breakfast. Meanwhile they wanted to pay for day use rights. I don't think so!! If they hadn't have had small kids with them, we would have told them to turn around and hit the trail again. Scenario two - a private guide showed up at the Elizabeth Parker Hut with two clients expecting to spend the night. I don't know about his clients but he at least didn't have a reservation and the hut was full. When we put up a fuss, he made a big stink about how he was the owner of a big Calgary outdoor store, he knew people, and wasn't going anywhere. Scenario three - We were staying in the Wates Gibson Hut, in the remote backcountry of Jasper National Park. We didn't have the hut fully booked so technically additional people could have shown up. This still doesn't give you permission to crash the hut though. A group of backcountry skiers showed up and since the hut was open wanted to spend the night. They had been planning on camping but decided to be opportunistic and make use of the unlocked warm hut. I made a big deal out of it and in the end they eventually agreed to pay me for two spots our friends had actually been unable to use - but had already paid for. Fair's fair folks! Don't expect to stay for free somewhere when everybody else has paid for the privilege. Hostels rarely see poaching because there's usually a caretaker on site but one more place that's horrible for freeloading is the Parks Canada shelters. I've witnessed myself as well as heard many tales of people crashing the Egypt Lake Shelter to escape rain at the campground. The last time we were supposed to stay there we actually canceled our reservation because it was going to be raining all weekend and we knew the whole campground would try to get into the shelter. It's a tiny cabin that requires a reservation. If there is space when you show up, you can pay to stay there on the spot but you can't stay at both the campground and the shelter. You pay for one or the other. It simply isn't fair to those who have paid to sleep inside to encroach on their space just because you don't want to get wet making dinner or you want a dry place to play cards. The bottom line - free loading isn't cool! Stay where you've paid. This isn't just aimed at women! In the backcountry everybody helps out and contributes to the basic necessities of survival: fetching water from the local creek, melting snow for water if necessary, keeping the fire going, cooking and yes - cleaning up. If you don't want to make the trek to get water you'd better go with a partner who is willing to do it for you (as my dear husband is always want to do). I confess I am a bit of a backcountry princess but that's why I always travel with my husband who is Mr. Backcountry! He makes sure nothing is left undone and usually gets water more than once in his stay at any given hut or cabin. He often cooks for our entire group and also carries everything in for the communal meals. He's a trooper! If you don't have a partner like that, I'm afraid you have to be a big boy or girl and help out! Note: that in our case, I do all of the planning, make the reservations, and coordinate everything with our group prior to our trips in order to help offset the fact that I will likely do less work when at camp. You wonder briefly where the water comes from but that's as far as it gets. You make your friends carry your gear for you while getting to backcountry destination (without them offering) - usually by begging, whining, or complaining. You leave the hut clean-up to everybody else. That includes sweeping, wiping down counters, making sure the last cup is clean, ensuring the windows are closed, and that the fire is out. You mooch off others. If you want alcohol - bring it. If you want tea or coffee - bring it. If you need Advil - bring it. (you get the idea) If you need to borrow something, it's suggested that you show extreme gratitude at the very least. Most people are willing to lend you a tea bag or Advil but expect nothing and show appreciation when strangers extend kindness. Of course if somebody offers you a glass of wine, that's a whole different story. It would be foolishness to refuse something generously offered to you. You don't at least offer to carry communal gear or food. Many people will refuse the offer, but you should at least acknowledge that somebody is carrying your dinner. Gosh, I don't know where the garbage went. Somebody carried it out? The bottom line - To quote my friend Kathy: Do more than you have to. Don't just wash your table, wash all the empty tables, take your turn with gray water, chop a little extra wood, leave the hut/cabin/hostel a little cleaner than you found it. The last time we stayed at the Elizabeth Parker Hut we were told that the hut was a place for mountaineers and our kids didn't belong. To that group - I suggest you visit Abbot Pass next time. That hut is for mountaineers. You will likely have all the privacy you need up there and can climb some big peaks while you enjoy your whiskey in the company of an all-adult crowd. Don't go to one of the Alpine Club's most family accessible huts and expect an adult retreat. Alternately, as mentioned in part one of this topic, book the whole hut for your group and don't invite any families. Outdoor Moms and Dads deserve respect! They have not only hauled their personal gear into the cabin but have brought in everything for their kids as well, often carrying or transporting the children too. To get into the Elk Lakes Cabin this weekend, 9km from the nearest parking lot, we had to pull a 60lb sled carrying our son as well as carry two backpacks full of our family gear. My husband was likely carrying close to 50lbs in addition to pulling that sled up to Elk Pass and down the other side. Next time you want to complain that the kids are too noisy, that you couldn't sleep, they woke you up, or that they don't belong in a backcountry hut - pause for a moment and reflect on the kind of childhood you had. Did you get to go camping? Did you get into the backcountry? If you didn't, I bet you wish you had. I had to wait until I was an adult to have the adventures my son has already had in his first three years. Applaud parents as they come in the door of the cabin and congratulate them on the brave and challenging adventure they most definitely had in getting there. We could be out RVing or traveling to Disney Land but we have a different plan for our family. Please support us. Bottom line - Rent the whole facility if you want to choose who you'll share it with. Otherwise - learn to share and make some new friends. Go out and play with the kids and rediscover the inner child in you. Thanks for reading this two-part series. 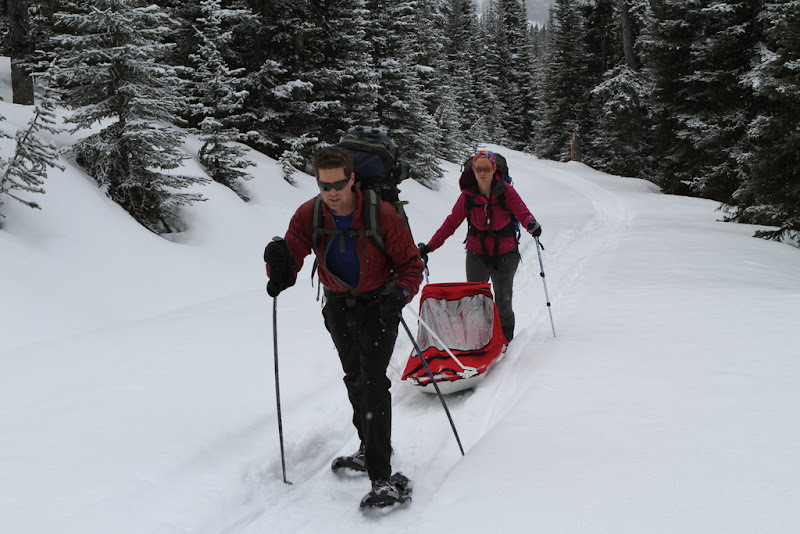 I'd still love to hear what other suggestions you have for sharing in the backcountry.